By now I’m sure you’ve heard that the European Space Agency has successfully landed a spacecraft on Comet 67P. Yay humans! To help you understand why this mission is cool, I’ve assembled a list of fun facts for you. So do your brain a favor and feed it. Fun Fact #1: Comet 67P is the short name for the comet. Its full name is Churyumov-Gerasimenko, after the two scientists that discovered it in 1969. It’s a chunk of ice and dust about 2.5 miles across with an orbital period of ~6.5 years. It also vaguely resembles a rubber duck, which is sweet. Fun Fact #2: The Rosetta space probe was launched a DECADE ago by the European Space Agency with many goals, only one of which was to send a landing module to the surface. The mission also hopes to determine its chemical makeup using various tools, including a 9in drill bit on the landing module that will harvest samples from below the suface for analysis. It will also send radio waves through the body of the comet to be picked up by the Rosetta orbiter on the opposite side, so that we can gain clues about what’s inside. All of this will be taking place as the comet approaches the sun so we can observe how the comet’s environment changes as it warms up. Fun Fact #3: The comet is SINGING!!! Well, sorta – they aren’t really sound waves. Rather, the orbiter detected oscillations in the magnetic field coming from the comet. Essentially the magnetic field is vibrating between 40-50 millihertz, orders of magnitude below what our crappy ears can detect. So scientists pumped these frequencies up to something we could hear and… well… it’s actually pretty creepy. More like space dolphin than rubber ducky. 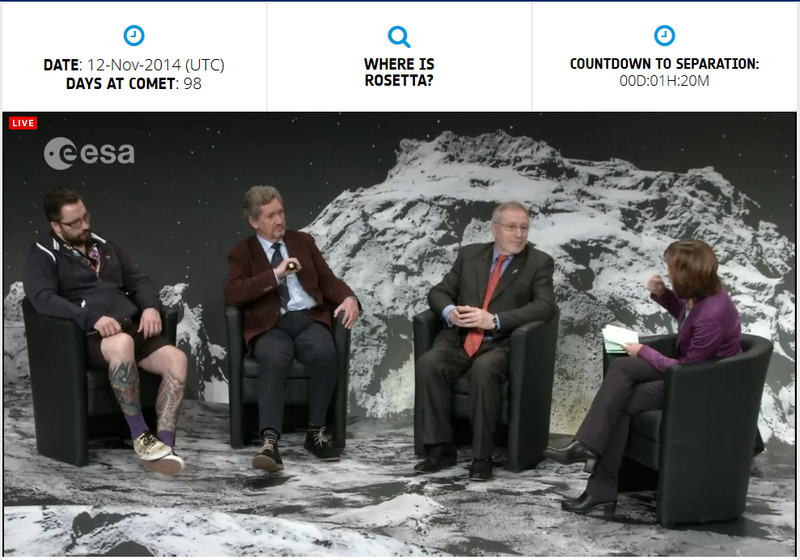 Fun Fact #5: I want to be friends with the lead scientist on the Rosetta mission. His name is Matt Taylor and he seems like a cool guy. He wore this crazy shirt for the televised event and I genuinely love that he let his freak flag fly. Science is awesome and shouldn’t be stereotyped as a bunch of stuffy pencil pushing geeks. Whatever brand of weirdo you are, you can make history. 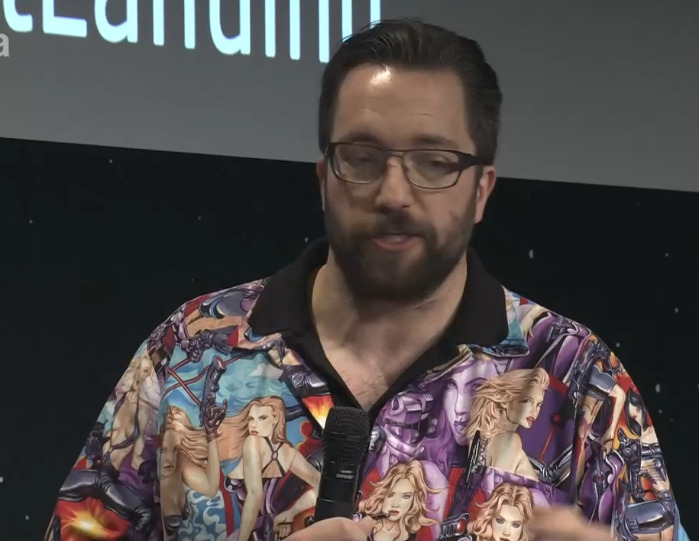 This guy knows what’s important and it sure as hell wasn’t his outfit – it was the fact that he just plunked a science lab onto a moving target thousands of miles away in space. Sexist nature of your shirt aside, you are metal as f***, sir. 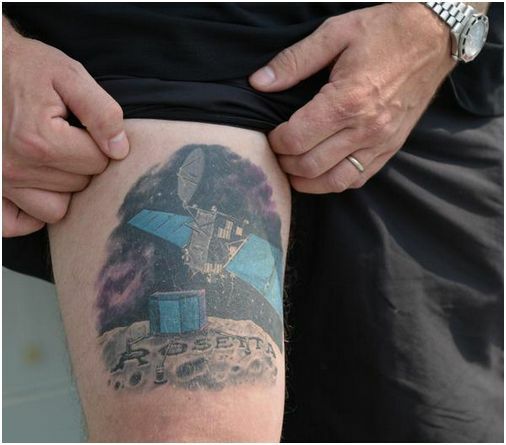 I wonder if he would have regretted this tattoo if the lander had crashed? MOST FUN FACT OF THEM ALL: There are real reasons to do this mission, not just because we wanted to see if we could. Scientists believe comets were important in setting the stage for life on Earth. During the infancy of our planet, comet impacts may have seeded Earth with the goodies we needed for life to begin, such the ingredients for nucleic acids (DNA) and amino acids (proteins). They also carry hella water, so it’s likely they contributed a lot of it to our great blue orb. Observing Comet 67P could give more evidence for these theories, and will get us just a little closer to understanding where the heck we came from.